With 15 days since the last league game, it almost feels as if the season is starting again but I'm sure the players (at least those who haven't been on international duty) will have appreciated the rest. From here onwards Swansea have games Mon-Thur-Sun-Wed-Sat-Thu-Sun giving 7 games over the next 3 weeks. It'll be an almost inevitable part of this that the Capital One cup game with Birmingham will see a weakened team played which is a shame as that's how we've got to the situation of being able to play the likes of Valencia and also we're already down to the last 32 of the competition without having kicked a ball so it's a competition that shouldn't be dismissed too lightly. Liverpool arrive at the Liberty on the back of 3 successive 1-0 wins, how much of that is luck and how much good defensive solidity will be revealed as the season goes on. Ahead of the match I've had a look at shot metrics by minute for both teams in each of their 3 games so far. Liverpool's game against Villa is a great example of game state (i.e., current score) has on attack level, Villa started the game dropping off Liverpool and looking to counter attack so Liverpool had the early shots. Villa's tactic backfires when Liverpool score and the second half is one way traffic but Liverpool to some extent will have been happy to soak up pressure while they were 1-0 up. 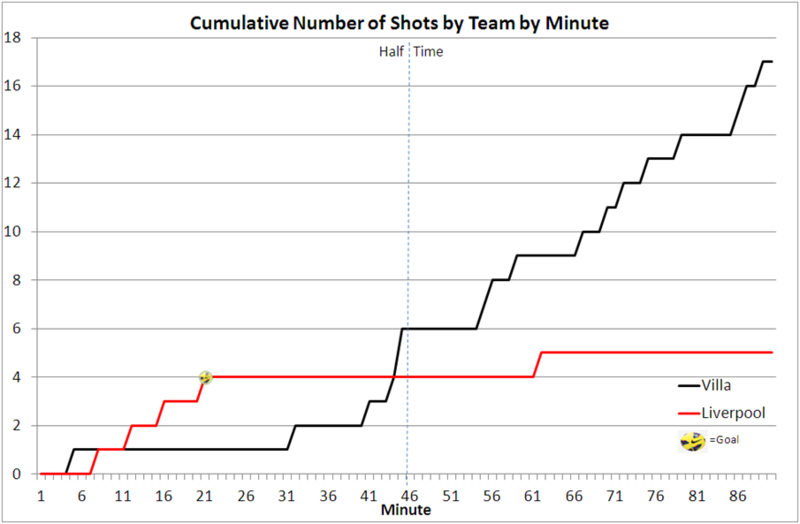 There's a good piece with more detail on Liverpool's defensive shell at StatsBomb. The full details of all 3 games for both sides is available in a presentation here. Obviously not all shots are equal and the next stage will be to look and chance quality to get a better feeling for the 'deserved' outcome of a match. Also in the presentation is a link to an interactive chart of all goals (scored and conceded) by Swansea so far this season, hovering over any of the goals brings up the goal detail and image of the goal. For the game tonight it'll be interesting to see if Laudrup is attack minded and plays Michu and Bony or whether he goes for a midfield 3 of Canas,Britton and Shelvey. Bony on the bench is arguably the pragmatic view to take when playing the team who were top of the league at the start of the weekend but starting him will be a statement that we're looking to win the game not just get to 60 minutes and see how things are panning out.